Bethany and I served this raw vegan carrot cake at our dinner party yesterday. Oh my gosh is it yummy! I had some for breakfast this morning too haha :) We made this carrot cake with a dinosaur blender that barely works, so if you have a food processor or high speed blender it will be much easier for you. Regardless, it was still simple and fun to make! This makes about 15 -20 servings. 2 Cups of shredded carrots (we used a mandolin slicer) Set the carrots aside for later! 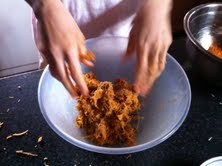 Put all ingredients except carrots in a food processor or high speed blender. Plan B: you can also mash it up quite nicely and easily by hand if you don't have any fancy equipment :) We attempted to put the ingredients in our blender, at first, but it just growled at us. haha. 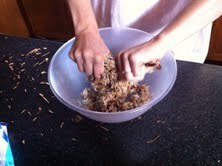 Next, add in shredded carrot. Next we used a 8inch by 10 inch plastic storage container...we wanted a pan but didn't have the right size. But actually the plastic storage container had a lid on it so it ended up being the perfect choice since the base is going to go into the freezer anyways :) We lined the plastic container with foil so it would be easy to lift out. 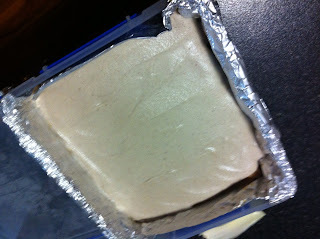 We spread the base inside, about one inch thick. Put in freezer to set. While your base is in the freezer it is time to whip up some frosting :) there is our fancy blender, using a fancy plate as our lid. Blend all ingredients well! We really wanted a creamy texture, so it was important to blend it for a long time!! 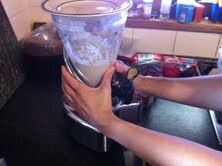 We let it blend for about 4 minutes. We didn't want it to get hot though, so you might want to give it a minute or two break in the middle of the blending. Keep checking it though, because all blenders are different.